Ptosis (TOE-sis) refers to an upper eyelid that droops and can occur in children or adults. The droop may be hardly visible, or it could cover the entire pupil. Depending on the severity of the droop, it could interfere with vision. People with ptosis may try to lift the eyelids or tilt their heads back to see more clearly. Most commonly, ptosis develops as part of the aging process, as the muscle tendon stretches or becomes separated from the eyelid. The tendon can also be affected by trauma, cataract surgery, or other corrective eye surgery. In some cases, a baby may be born with ptosis (congenital ptosis). A droopy eyelid can also be caused by a neurological disorder, an eye tumor, or a systemic disease such as diabetes. 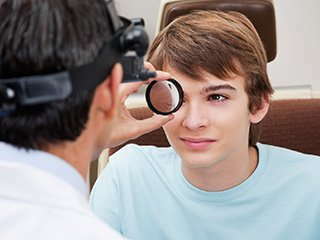 Your eye care professional will examine your eyelids carefully by taking detailed measurements of the height of your eyelids. He or she will also assess the strength of your eyelid muscles. For childhood ptosis, surgery may be required to improve vision and cosmetic appearance while preventing or reducing future vision problems. The surgical procedure involves tightening the muscle that lifts the affected eyelid. In cases of severe ptosis with a very weak muscle, the doctor can attach or suspend the eyelid from under the eyebrow so that the forehead muscles lift the eyelid. In adults, ptosis treatment usually needs surgery. In milder cases, creating a small tuck in the lifting muscle and removing excess eyelid skin is sufficient to raise the lid. However, more severe ptosis requires reattaching and strengthening the muscle.